'Royal Mile 5 mins walk, FREE parking/Wifi' is a central 2 bedroom flat overlooking Holyrood Park, with stunning views of Arthur's Seat. Within 5mins walk of Scotland’s premier tourist hub, namely the Royal Mile/Holyrood Palace/Scottish Parliament/Arthur’s Seat area. A 5mins walk in the other direction takes you to London Road, a major bus nexus providing access to Princes Street (5mins), routes to the Old/New Town, the Royal Yacht (15mins) & Edinburgh Zoo (30mins) etc. The apartment has FREE WiFi/Parking & is 5mins away from shops. 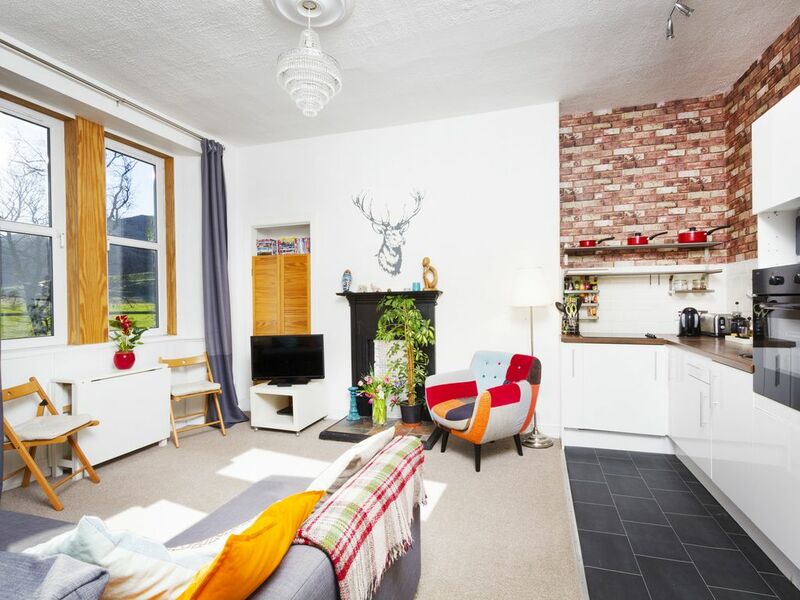 This central Edinburgh (see our map “photo”) apartment occupies a quiet position on the second floor of a traditional Scottish tenement building, situated at the end of a peaceful cul-de-sac that provides pedestrian access to Holyrood Park. There is a Secure (buzzer) Entry System with an intercom providing additional security. The apartment is situated pretty much as close as you can get to all the historic Old Town sites and visitor attractions in Edinburgh with FREE on street parking. Most of central Edinburgh is unfortunately (expensive!) metered parking zones. The apartment comprises an attractive, bright, open plan living room / dining area / kitchen. It's a lovely open and comfortable living area with plenty of room to kick back and relax after a hard day out seeing the sights or attending a work event. The living room has a large sofa bed which pulls out very easily to form a good sized (6Ft 8') double bed. The modern kitchen is well provided with crockery, cutlery, glasses and kitchenware, a washing machine, dish washer, integrated fridge/freezer, cooker, microwave as well as electrically wired heat & smoke detectors. In the vicinity there are a number of smaller shops as well as (5mins walk) the substantial Meadowbank shopping centre that includes a Sainsburys, TK Maxx and other high end outlets. However, for those that prefer to dine out, cosmopolitan Edinburgh is renowned for its large selection of restaurants, with a variety of restaurants / pubs close by. There is a spacious bedroom with a European King sized bed (6Ft 6' by 5Ft 2'), double wardrobe with integrated drawers for storage & a 3 seater couch. The second bedroom is a single (box) room with single bed and a wardrobe. The shower room, with toilet and wash hand basin, has been recently modernised to a high standard. Off the hallway there is an additional toilet & wash hand basin. A pleasant 5 minute walk through Holyrood Park takes you to the buses at the foot of the Royal Mile or alternatively to London Road, a major access road, whose numerous bus routes provide access to the main tourist and shopping destinations. Whenever possible, guests will be welcomed personally at the property for the handover of keys. As you would expect, crisp fresh linen, bath and hand towels are provided for guests. In addition, local information / literature, iPod docking station and a small selection of books, DVDs & board games have been provided for your perusal. Due to local restrictions, the maximum length of a stay is 30 days. I was born and brought up in Edinburgh, have spent most of my life in this beautiful city & previously worked for the Scottish Government, in roles ranging from Policy Development to briefing Ministers. I own & manage my apartments and, thanks to repeat visits & many positive reviews, now do this on a full time basis. I have created very thorough welcome folders and email out apartment specific (4 page) brochures which have instructions on the various modes of transport to get to each apartment, as well as information (& a map) on nearby bars / restaurants / shops etc and links to things-to-do while in Edinburgh. All in all I’m fully incentivised to ensure that you have a great time and (hopefully) come back again and/or recommend my apartments to your friends! Quite simply, the best of what Edinburgh has to offer is right on your door step as the apartment is located in the heart of the City (see our map “photo”). Scotland’s premier tourist hub, namely the World famous Royal Mile / Holyrood Palace (the Queen’s residence) / Scottish Parliament / Arthur’s Seat (set in a 650 acre park, is the view from your living room window) area, is within a 5min walk, while a 5 min walk in the other direction takes you to London Road (a major bus nexus providing access to Princes Street in 5mins and routes to the Old/New Town, the Royal Yacht in c.15mins and Edinburgh Zoo in c.30mins etc). And, despite its central location, the apartment benefits from much sought after FREE WiFi & FREE on street parking! Without a doubt the apartment’s central location (beside Holyrood Palace & a 650 acre park), amazing views, pedestrian access to the park, close to the main attractions and ready access to FREE parking has been a major draw. Nearby there is a major shopping centre (5mins walk), other shops / pubs / restaurants, numerous bus stops (including an airport / tour bus stop) and it’s close to the main train station (Edinburgh Waverley). In short, this apartment is a great base to make the most of your visit to Edinburgh! ................ I speak English; however please note that over the years I have found Google Translate very effective for assisting with queries & handling bookings in other languages. The shower room, with toilet and wash hand basin, has been recently modernised to a high standard. Central location, on the 2nd floor of a traditional Scottish tenement building, benefiting from FREE PARKING. Within walking distance to the City Centre, The Royal Mile & main tourist attractions. Quality bed linen, duvets and pillows are provided. A bath towel and hand towel is provided for each guest. The flat benefits from stunning views of Arthur's Seat from the living room window. The dining table is situated in the Living room next to the window, which offers spectacular views of Arthur's Seat & Holyrood Park. There is seating for 5 & a chair mounted high chair is available. A small selection of books, DVDs & board games have been provided for your perusal, along with an iPod docking station. Very comfortable flat, beautiful park view and excellent hostess attention. The apartment is very comfortable and very well equipped, with beautiful views to Holyrood park. The beds are very comfortable and the main room is spacious and cozy and the bed linen and towels are very good quality. The hostess's attention, Eleanor, is excellent! I enjoyed the stay with my family. It is located near the Royal Mile and old town. I would like to improve the entrance to the building. Great place to stay, fit our family of three easily. Property is perfectly situated between old town/royal mile and the Arthur’s seat hiking area. Beautiful view outside living room windows. Thanks! The apartment was great! Clean and close to everything! Eleanor was great a great host! Great location with stunning views of Arthur’s Seat. The apartment was great for three adults . It is in close proximity to Holyrood Palace and the Royal Mile. Very easy to catch a bus to Princes street. Holyrood Park is just out the door. Maybe a downside for some people is there are a few stairs to walk up to the apartment, so if you have heavy luggage it is a bit of a problem. Otherwise, the apartment has everything you need. It is a.5 minute walk to Sainsburys. Transport Links are excellent as the apartment is close to several main bus routes which access most areas of the city and beyond. A) Bus/Airport: The Airlink 100 service (£4.50) runs from the airport to the City Centre (Waverley Bridge), from where it takes c. 25mins to walk to the apt., although we recommend using a phone GPS tracker. D) Car: Nearby access to the city bypass & motorway networks is very useful. It can sometimes be difficult to find free parking in Edinburgh City Centre but Milton Street is probably as close as you can get to the Royal Mile and the Old Town and be able to PARK FOR FREE at all times. 1) Milton Street: The apartment is very centrally located with all of Edinburgh's tourist attractions within easy reach. Ideally situated for the Royal Mile (5 min walk), Palace of Holyrood House (5 min walk), Scottish Parliament and Dynamic Earth (5 min walk) as well as having the beautiful Holyrood Park right on the doorstep. There are also numerous festival and 'Fringe' venues (the famous Pleasance through the park, 10 min walk), the Grassmarket and Cowgate (15-20 min walk) Edinburgh Castle (15-20 min walk). 2) Edinburgh: The Old Town's cobbled streets, closes (alleyways) and historic Victorian / Georgian architecture make it visually stunning. The grandeur of the New Town, designer/boutique shopping on George Street and an immense choice of restaurants and bars make it a city to suit everyone's taste and budget! 3) The Festival city: Festivals are what Edinburgh does best, with something going on all year round. The high summer Military Tattoo & International and the Fringe are perhaps the best known, however to name but a few Edinburgh hosts the Science festival (April), Film Festival (June), Jazz & Blues Festival (July), Book Festival, Mela (August) and numerous gourmet food events. 4) Entertainment: Edinburgh has a throbbing night-life, is home to various jazz bars, comedy clubs, while during the summer street entertainment & busking Bag Pipers are never far away. The nearby Playhouse (15-20mins) & Festival Theatre (20min walk) host an abundance of cultural events, including operas, ballets & stand up comedy shows. 5) Walking in The Green City: Edinburgh is a fantastic city to visit and is small enough to walk around. Holyrood Park, Princes Street gardens and the meadows (tennis & pitch n putt golf!) are popular places for a stroll, offering a change to the ever present guided historical / ghost tours! For the more energetic, Arthur's Seat (1min away), an extinct volcano, is crisscrossed with walking trails and is popular with runners / cyclists as well as tourists for some of the best views of the city from Salisbury Crags. In addition, the Botanical Gardens and Edinburgh Zoo, home to the UK's only Giant Pandas, are both worth a visit and are accessible by bus. 6) Hogmanay, the Scottish New Year: The Scots word for “the last day of the year.” Enough said! All in all, in the sunshine there is nothing better than wandering around the streets soaking up the atmosphere. When it rains (which has been known!) you are never far from somewhere interesting to dash into out of the weather. Edinburgh boast a huge number of Art Galleries, Museums, theatres and live music venues as well as Cinema's, indoor shopping centres and entertainment Plaza's - something for everyone!